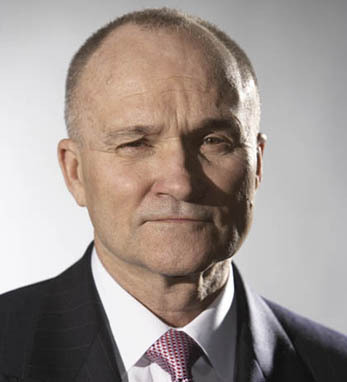 Raymond Kelly is the first person to serve as Commissioner of the New York Police Department for two nonconsecutive terms: from 1992-1994 under Mayor David Dinkins and from 2002 to the present under Mayor Michael Bloomberg. Kelly was appointed to the New York City Police Department in 1963 and quickly rose through the ranks. As commissioner, Kelly has had many accomplishments, including creating the first counterterrorism bureau of any municipal police department in the country, establishing a new global intelligence program, driving down crime rates by 40%, and creating the Real Time Crime Center, a facility that uses data-mining to search computer records and provides leads for detectives. Between his terms as Police Commissioner, Kelly served as Senior Managing Director of Global Corporate Security at Bear, Stearns, & Co.; Commissioner of the U.S. Customs Service; Under Secretary for Enforcement at the U.S. Treasury Department; Vice President for the Americas of Interpol; and Director of the International Police Monitors in Haiti. Kelly holds degrees from Manhattan College, St. John’s University School of Law, the New York University Graduate School of Law, and the Kennedy School of Government at Harvard University. He was also awarded with honorary degrees from 11 other colleges. A second-generation Irish American whose four grandparents were all born in Ireland, Kelly and his wife, Veronica, have two grown-up sons, one of whom, Greg Kelly, a fellow Top 100 honoree, is the host of Good Day New York on Fox 5. Last year, Ray led the New York City St. Patrick’s Day parade as the Grand Marshal. In March, NY City Council Speaker Christine Quin presented Kelly with the Thomas Manton Irish Man of the Year Award.